Tiny restaurant specializing in multi-course tasting meals with paired wines. : Guests must walk past an open kitchen, no larger or fancier than many home versions, to reach the tiny, three-table dining area. 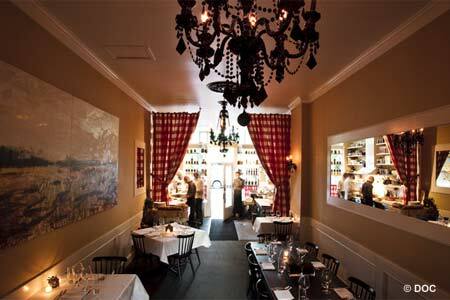 But don't be misled by the intimacy: DOC is a special occasion restaurant. Its name stands for "Denominazione di Origine Controllata," the Italian classification for wine appellation, and it signifies the staff's attention to terroir for both wine and food. The menu changes weekly depending on regional ingredients available at local farmers markets and purveyors. It's hard to say which treats will arrive at your table, but offerings have included cherry, cucumber, almond and feta salad; risotto with chicken, spinach, green garlic and Parmesan; steelhead trout, cauliflower, walnut and chicory; wild king salmon, morels, grilled greens, gnocchi and chestnuts; lamb T-bone complemented by padron peppers, peach and avocado; and an elegant take on Portland's zoo favorite, “elephant ears.” An additional $40 (well worth the money) brings wine pairings from the knowledgeable house sommelier, or you may try your own hand with the extensive, all-Italian wine list. Consider ordering à la carte Tuesdays through Thursdays; on weekend nights only the tasting menu is available.